When I had sent the draft of Now, Returned to India to my beta readers, the word count stood at nearly 98, 000. As I had mentioned in an earlier post, almost every reviewer had mentioned that my writing seemed verbose. 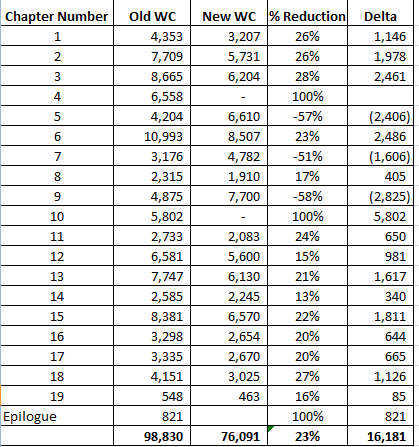 So when I sat down to reduce the word count, I also began to maintain a chapter-wise ‘before and after’ word count. I also kept track of what was the reduction in words in percentage. During the process, I also learnt an important lesson – how to narrate the story in as few words. I am posting the results of my two week long effort below. Note that I also merged two chapters which would explain the numbers in the paranthesis. I am not sure if this was the most effective way of reducing the length of the manuscript, and would like to know how others go about the process. Previous Post How did I approach beta readers to review my novel? Thanks for sharing and very interesting. I still have yet to send my manuscript to my editor and then onto the publisher. I am interested to see what ideas they have for me. My word count is no where close to yours though. Good effort. I know it is difficult to reduce the word count. But every writing guide teaches us to reduce all the unrequited words, scenes and even chapters that don’t reveal character or advance the plot.